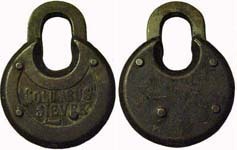 "COLUMBUS 5LEVER" - 4 Rivets - High shackle. 3 3/4" high x 2 3/4" wide x 3/4" deep. "Model Patented" is stamped on the reverse of the in Russian. "1914" is stamped directly below that. The key is marked "KOLUMBUS*MADE*IN RUSSIA*". (I-100).